just had to finish one last quilt to take with me, coloured blocks running along both sides and the center a long expanse of white linen. this shot is pre-binding, which i finished last night. whew! my business cards were finally delivered this morning, just in the nick of time. double whew! fleur playmat patterns all printed up and ready to go. i'm also selling some clover binding makers and rotary cutters that i picked up at a clearance sale in canada a couple of years ago. been meaning to sell them for ages now and figured this show is the perfect market. quilt display stand that shane whipped up for me over the weekend (carpenter husbands are great, i tell ya). 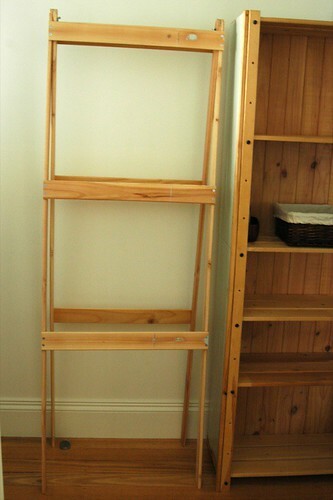 can't wait to see it set up in our space with quilts draped over each rung. have fun and you are crazy amazing pulling out another quilt like that. good luck... and wow... another quilt!!! PLease take photos of the display (specially the quilts) I would love to see how everything looks before!!! I'd like to think I'd make it - but our car has conked out this week and it's kind of stimied my plans! Sending good wishes for mega sales your way, although I'm confident that side of things will take care of itself! PS hope the mag arrived - don't stress, I know you're busy, just hate to think of it going astray! You'll be unrool. Wish I was there to do some purchasing! Good luck with the show - I'm coming in tomorrow so hope to see you. Good luck Leslie, I'm sure it will all go off beautifully :) I can't wait to get there - unfortunately not until Saturday for me. Great Quilt and yay for playmats. We look forward to meeting you at the S&C show. very nice! GREAT business cards too. Enjoy the show. Aren't ergo's the best!!? Have fun at the show! I love your cards and the quilt stand. good luck and have fun at the market! wish i could come! Wow what a busy women you have been/will be. All with a little baby! I am going on Thursday, I hope to meet you then. oh, leslie. everything looks so great. i hope the fair is a totally enoyable. new friends. and lots of sales! Goodluck Leslie! Everything looks beautiful. Many sales to you! Good luck! 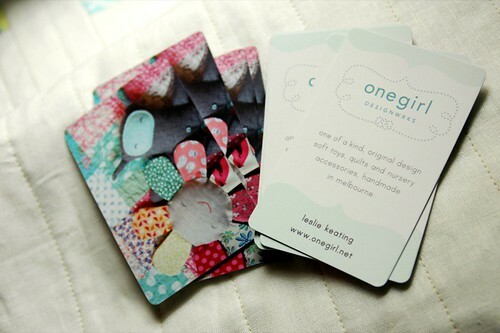 I love your business cards, they are perfect! Leslie, good luck at the faire! 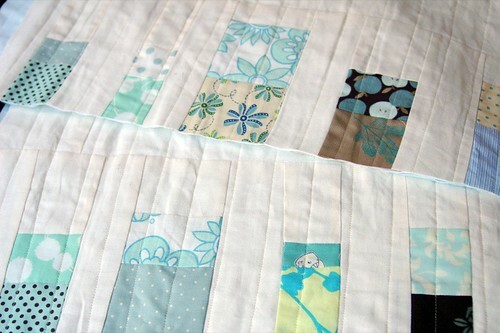 I am lovign your unplanned quilts, what fabric do you use for the backgrounds, the white and cream cotton... I have been using Kona Bay Snow, but was curious what you liked. thanks for all the sweet well wishes! we were at the show until 10:30pm last night, trying to cram as much product as we can into a very small space, but i'm feeling really good about how it's all looking. sara, the creamy white i used in the quilt is linen or a linen/cotton blend. it's terrible that i don't know but i must have found it thrift shopping - i just can't remember buying so much yardage. it feels great and was lovely to work with so i'll be using linen again, for sure. Good luck, Les! Your stuff all looks amazing so I know it will be great. Just wish I could be there. 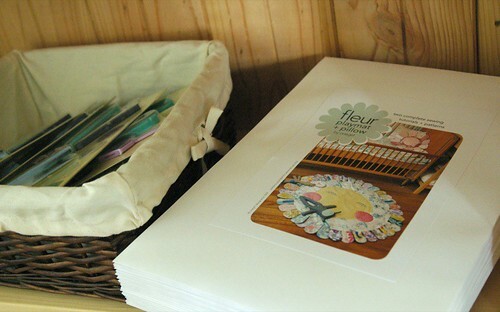 I would like to make a quilt for my baby daughter using linen. I have some red and white already, but need more white linen. Do you know of an online source that has some? Have fun. Looks like you have everything in order. Good luck in the show!! Enjoy it! ck, i'm afraid i can't be of much help - i don't buy linen online as i think it's important to feel it first. linen can be woven in so many different ways and can be quite rough to i always like to feel it in person and make sure it's nice and soft before i buy. i just tend to buy it when i see it in various fabric shops - going into winter it's becoming a bit hard to find but if you do find some, it should be on sale now. good luck! Hi Leslie, I went to the show on Wednesday and called in quickly again this afternoon but didn't catch you to say 'Hi' either time. Your stand looks great though........will meet you another time!